Sahyadri International School, Shiblapur has advertised in THE Lokmat newspaper for recruitment of Principal, Teachers jobs vacancies. Interested and eligible job aspirants are requested to attend interview on 31st May 2018 .Check out further more details below. 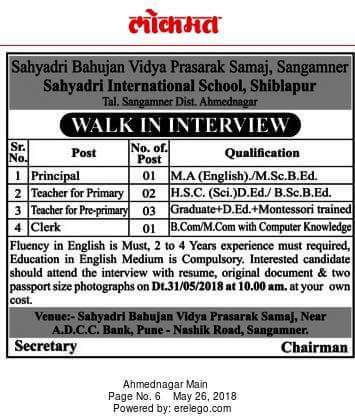 Name of the School: Sahyadri International School, Shiblapur. 2 to 4 years of experience needed. Salary is not constraints for deserving candidates. How to Apply: Interested and eligible candidates may attend interview will be conducted on 31st May 2018 timing 10.am. Appear with all relevant original documents and Xerox copies of the same and a passport size photo. Reference: Advertisement on THE Lokmat newspaper Dated 26th May 2018.